I’m sure by now that most of us living in the Gulf have more than a passing familiarity with the charms of nearby Oman – whose rich and vibrant history is only surpassed by its natural treasures. Whether you desire picture perfect white sandy beaches, arid mountains, golden dunes, or wadis dotted with crystal clear pools, you won’t have to go far, to find one all to yourself in this country that has been deemed the Jewel of Arabia. Indeed, Oman has been much touted as of late as an up-and-coming tourist destination, and the effects can certainly start to be seen in the capital city, Muscat. However, getting off the beaten tourist trail is, as always, highly rewarding in Oman, and nowhere more so than in the Southern Dhofar region. Well known for its annual khareef (a colloquial Arabic term for monsoon), Dhofar and its chief port city, Salalah, is the only place in the Gulf that experiences an annual monsoon season, and its mist shrouded hills tend to be a big draw for heat stricken GCC residents between the months of July and September. However, Salalah enjoys a pleasant climate year round and the residual effects of the khareef create a dazzling pocket of green in a sea of dust. Salalah itself was a prosperous trading port of frankincense in the 4th century BCE and is the traditional seat of Oman’s Sultan, as well as being the second largest city in Oman. With all of this in mind as I boarded my Oman Air flight to Salalah, I must admit that I was more than excited to spend a weekend away from the gruelling traffic, bright lights, and hectic pace of the city. During the comfortable and well serviced journey, I amused myself with visions of swaying palm trees, waves gently crashing on endless beaches, and a sky-full of glittering stars. My visions of unspoilt nature turned out to be quite precise, however I didn’t need to sacrifice any creature comforts to enjoy it as I was spending my weekend at Salalah’s newest and grandest resort – the Salalah Rotana Resort. 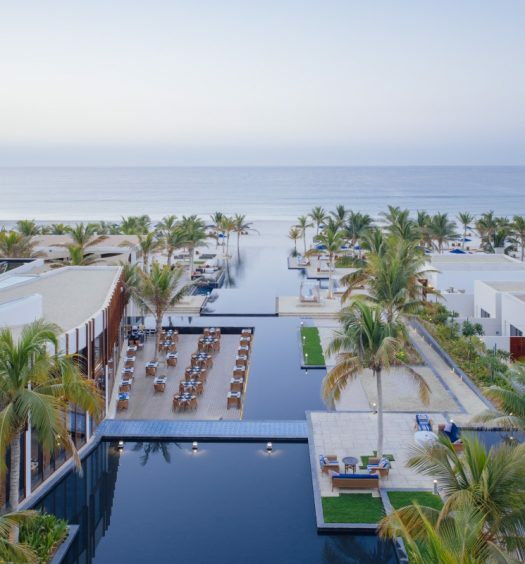 The Salalah Rotana Resort was opened in March 2014 and boasts 400 rooms and suites spread around manmade Venetian waterways. Set on a stunning 8.2 kilometre beach that is the highlight of the property, the resort is built in traditional Omani architecture tastefully accentuated with elements of the surrounding rugged beauty. I arrived late in the evening and was warmly greeted and whisked off to get acquainted with my Premium Ocean Front Suite, my home for the next two days. The Suite was truly a slice of paradise, decorated in a minimalist Omani style, with a large bedroom, a living area, kitchen, two bathrooms, and an ocean-facing furnished veranda. The bedroom was impressive but warmly inviting, with a vaulted clay ceiling and a bed carved from desert rock. Carved wooden windows opened to the beach and I promptly fell asleep to the sound of the waves, practically at my doorstep. This is certainly a unique sensation in the GCC, despite the many beaches. After the kind of deep restorative sleep that can only be had in that special silence found in a natural setting, I started my morning early with breakfast on the veranda, ordered from the extensive room service menu, and ate with an unhindered view of the white sand beach. After a leisurely stroll, I set out to explore some of what Salalah has to offer to the traveller. Highlights included the Sultan’s marbled Palace, the traditional souk in old Salalah, Mughsail Beach and Marneef Cave, famous for its blowholes. However, simply driving around Salalah is half the pleasure, as everywhere you look provides a new experience for the senses. There are palm tree-lined roads with open air shops selling fresh young coconuts, and spectacular viewpoints over untouched white beaches lapped by the strikingly turquoise Indian Ocean. One can gape at rugged peaks with twisted, yet noble frankincense trees growing improbably out of the rock, whose peeling bark fills the air with a nostalgically ancient smell. Venture to sweeping beaches whose only sunbathers are camels, who, keeping in line with the famous Omani hospitality, are very friendly and approachable. There is wonder to be found everywhere you go in Salalah, and all of this with hardly another tourist in sight. Further inland one can explore the many wadis and green mountains so iconic of Salalah, and around the khareef, waterfalls as well. It is a trekker’s paradise and also well appreciated for the variety and scope of wildlife and bird viewing. After a day of such adventure, I was happy to return to the hotel for some pampering at Zen the Spa, a Rotana concept that focuses on holistic healing with a touch of luxury. I was treated to the signature massage and after a thorough consultation with the therapist; she went to work easing out the knots and tension of modern day living. Although quite a massage enthusiast and someone who believes religiously in spoiling myself, I can honestly say that this was one of the best massages I have ever experienced. I left feeling my tension spots relieved, however not weighed down or groggy, but rather refreshed and energetic. So energetic in fact, that I elected to go for a swim in the sea, which was not your average Arabian Gulf floating session. The beach at the Salalah Rotana Resort, much to my delight has waves, and somewhat large ones at that, and getting out past the break is no easy feat. However, there is nothing like bobbing in a gently rolling sea and until I had to swim back, I enjoyed watching a stunning orange sunset from the water. Dinner was served at Silk Road, Salalah Rotana resort’s signature dining concept, with a perched view over the resort and an extensive menu incorporating cuisine from along the traditional Silk Road. Luckily, the servers are well educated about what is on offer, as after perusing the large menu, I couldn’t make up my mind and asked for recommendations, which I was very satisfied with. After another peaceful night under the stars, the next day brought with it another essential Salalah adventure: Dolphin watching. Around the Ocean, a company specialising in dolphin sighting tours, as well as fishing and other marine activities, was to be my host for today, and we set off to observe these spectacular mammals enjoying their natural habitat. Around the ocean has the utmost respect for the dolphins and is careful not to disturb or lure them. Even so, the fun loving creatures are far from shy and we spend hours watching them swimming and playing. We were even given the chance to swim in the ocean, and while the dolphins won’t come closer than several meters, it was still an exhilarating experience and a highlight of my trip to be swimming so close to them. I was pleased to see that Salalah had certainly lived up to its fabled natural beauty and of course, was not lacking in the hospitality that is so characteristic and has been recognised for hundreds of years of the Omanis, well captured by the scenic resort. Indeed, Dhofar may yet be one of the last places to capture the Arabia of the romantic imagining – a place where you can feel transported in time, at peace with nature, and yet completely at ease in the knowledge that you are in complete safety. Abu Dhabi,Dubai, Bahrain, and Doha, and has recently increased weekly flights to drive further tourism to the city. Oman Air also has attractive package offers with the Salalah Rotana resort to make the most of your money. Visit www.omanair.com for more information.